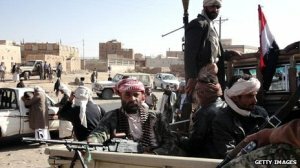 The Yemeni government and Shia rebels in the north, known as the Houthi, reached an agreement Saturday to end fighting which has raged for weeks in the country’s capital, Sana’a. Although the situation appears to be calming in the wake of this UN brokered deal, tensions remain high in Yemen. Extreme poverty, public anger and other long term problems, coupled with the power void left by former president Ali Abdullah, are exacerbating increasingly violent tensions threatening to tear this small Arabian country apart. In early 2011, Yemeni citizens took to the streets during the fervor of the Arab Spring to demand political reform, improved economic conditions and the resignation of longtime President Ali Abdullah. Abdullah was replaced by his deputy, Abdrabbah Mansour Hadi. Hope rapidly evaporated into despair as Hadi’s new, US and UN supported government, failed to bring any economic relief to poverty stricken citizens and stabilize the tensions in this turbulent nation. Tribal tensions, sectarian fighting, separatist movements, Al-Qaeda, poverty and public anger have plagued Yemen for decades and the intensification of these trends is rapidly driving the country towards fragmentation. The Houthi are the most physical and current manifestation of threats inching Yemen closer to failed state status. The Houthi emerged from their power center in the north earlier this month and in a series of lightening attacks battled their way to the capital, capturing extensive territory in route. Rebel Houthi troops captured state television stations only hours before the new peace deal was agreed to. The government in Sana’a was only narrowly and with extensive assistance from the UN able to save itself. Although the Houthi have been momentarily subdued, Yemen faces more potential violence from separatists in the south. The nation is deeply divided on religious and tribal fronts. A southern separatist movement caused civil war in 1994 only four years after the nations unification. The years since have witnessed many additional uprisings and ceasefires in the area. Tensions remain high to the day as a chorus of southern voices call for independence. It is only a matter of time before armed militants from the south surge forth to the capital. Perhaps more threatening than regional separatists is the presence of one of Al-Qaeda’s most organized and sophisticated branches in Yemen. Al-Qaeda’s presence has naturally turned Yemen into one of the focal points of the United States’ war on terror. American administrations have provided successive Yemeni governments extensive military and logistic counter-terrorism support to no avail. Additionally, American drone strikes, coordinated mostly by the CIA, have riddled Yemen with craters and bodies. There have been an estimated 70 airstrikes and 80 civilian deaths. These interventions began in the early 2000’s and have continued and even intensified through Yemeni political reform. At best, drone strikes and counter-terrorism efforts directed at Al-Qaeda proved moderately successful and only in the short run. In the chaos of political reform, Al-Qaeda has been able to recover all previously weakened capacities. The organization captured and consolidated control of swaths of the countries east and south. In short, American drone strikes have done little to stop al-Qaeda and have only intensified public anger towards the US and Yemen administrations. Despite the recent ceasefire with northern rebels, it is likely that Yemen will eventually tear itself apart. American intervention has done nothing to hamper Al-Qaeda or promote a peaceful transition to democracy. Interventionism in Yemen has provided military training and assistance, but little to nothing has been done to relieve the underlying extreme poverty exacerbating the situation and driving young men to join militia groups. American missile strikes have turned the public in Yemen both against the US and their own government. Yemen is spiraling down into a pit of destruction that will eventually produce more groups and individuals with hatred toward the United States. Yemen is just another Iraq or Libya, a sequence in a series of short sighted, self-destructive foreign policy blunders that are coming to define 21st century American international relations.